Rutgers University Press, 9780813543185, 288pp. Every year, American universities publish glowing reports stating their commitment to diversity, often showing statistics of female hires as proof of success. Yet, although women make up increasing numbers of graduate students, graduate degree recipients, and even new hires, academic life remains overwhelming a man's world. The reality that the statistics fail to highlight is that the presence of women, specifically those with children, in the ranks of tenured faculty has not increased in a generation. Further, those women who do achieve tenure track placement tend to report slow advancement, income disparity, and lack of job satisfaction compared to their male colleagues. Amid these disadvantages, what is a Mama, PhD to do? This literary anthology brings together a selection of deeply felt personal narratives by smart, interesting women who explore the continued inequality of the sexes in higher education and suggest changes that could make universities more family-friendly workplaces. The contributors hail from a wide array of disciplines and bring with them a variety of perspectives, including those of single and adoptive parents. They address topics that range from the level of policy to practical day-to-day concerns, including caring for a child with special needs, breastfeeding on campus, negotiating viable maternity and family leave policies, job-sharing and telecommuting options, and fitting into desk/chair combinations while eight months pregnant. Candid, provocative, and sometimes with a wry sense of humor, the thirty-five essays in this anthology speak to and offer support for any woman attempting to combine work and family, as well as anyone who is interested in improving the university's ability to live up to its reputation to be among the most progressive of American institutions. Elrena Evans received her MFA in creative writing from The Pennsylvania State University, and is a columnist for Literary Mama. Her work also appears in the anthologies Twentysomething Essays by Twentysomething Writers and How to Fit a Car Seat on a Camel. Caroline Grant is Senior Editor and a columnist for Literary Mama. She holds a PhD in comparative literature from the University of California at Berkeley. 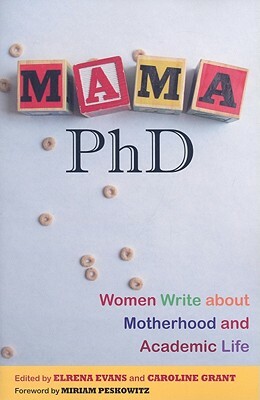 "Well-written, personal, insightful and engaging, Mama, PhD gives an accurate glimpse into the feelings and conflicts that mothers in academia don't often reveal because such disclosure is felt to be unprofessional." "All those sleepless nights and dirty diapers and baby food in your hair-where's the discursive construction of motherhood when you need it? It's here, in these smart, funny, poignant essays that struggle to balance mind and body, to balance body and soul." "Through the voices of those who have weathered the storm, Mama, PhD provides invaluable lessons for young scholars-both men and women-striving to navigate family and academic careers." "This is a charming, heartfelt book that expresses the difficulties and the joys of combining a life in academia with motherhood. Each story is different, but the experiences and challenges are widely shared." "Each writer beautifully articulates the personal details of her own experiences. Whether working to conceal their family lives in order to maintain professional credibility, fighting with administrators for fair and flexible treatment, defiantly toting infants into the offices of their advisers, or dropping out of academia to search for different ways to combine intellect and motherhood, the contributors to Mama, PhD offer themselves up as potential role models to women wondering how to tackle these two demanding responsibilities." "An optimistic narrative of work-family balance among women with PhDs. Mama PhD gave advice about achieving a successful work-family balance in academia, presented several models of success, and left me with a more optimistic view of my chances at balancing child raising with s successful career." "A unique and potent mixture of memoir, analysis, and advocacy. Mama PhD stands out in its ability to blend testimony, analysis, and advocacy, from a variety of perspectives. This volume raises striking questions about women's changing roles."